The XOTOME is a hybrid, a cross between the periotome and a root elevator. Severing of the periodontal ligament and creating space along the mesiodistal plane is executed with precision and accuracy because of the thin honed instrument ends made from the finest surgical steel. 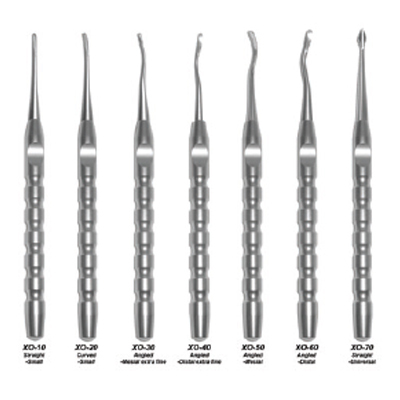 In addition to severing periodontal fibers, the narrow tips preserve tissue structures and eliminate bone fracturing while the custom sure-grip handle has a thumb rest for even power transfer of hand pressure.